Devilman is the story of Akira, a high school student who gains the powers of a demon. These demons which once ruled the world were forever entombed in ice. Until now, at least. The only way to fight them is to wield their incredible powers against them. Together with his friend Ryo, Akira is willing to do just that. I really enjoyed this manga, and am very happy I got a chance to read it. Sections of this manga grew much darker than I expected them to be, even knowing the general premise of the story. Devilman holds no punches in either its art or its storytelling. Characters are not immune to pain or suffering. Yet, this never seems egregious or added simply for shock value. It all has context and reason. The art in this manga is interesting. This definitely fits within Go Nagai’s style, but might catch some American readers off guard. The characters have a more ‘cartoonish’ aesthetic than one might expect, especially from a horror manga. Not only did I enjoy the art style, but I think it enhanced the horrific, frightening elements of the demons. The demons are grotesque, some looking more like the standard demon or monster but with many more having extremely creative, very different character designs. As cartoon-y as some of the normal human characters might be, the demons are not. They’re scary. They’re frightening. And they stand out in very stark contrast to our human protagonists. A few sections of the manga did become just a bit info-dumpy. The world building was fantastic in itself, and these sections did hold my attention. However, the characters weren’t doing much of anything except talking back and forth which does make the art just a little boring. Even so, the demons, their history, and the history of the earth itself is very interesting, and I enjoyed reading these sections. They didn’t turn me off from the story at all, and remained fast paced despite a lack of the battles which pepper most of the story. There are plenty of fight scenes in this manga. We get to see Devilman fight back against the demons. We get to see the human characters, mostly Ryo, fight as well. These sections are scattered with fantastic one and two page spreads. The demons are shown in all their horror. The ending of volume one saw my attention waning as well. While each new adventure in this section was fun in itself, it did feel like the plot was a bit lost. Even so, I will absolutely be reading the second volume in this series. It was fun, with some very interesting character designs, and remains one of the most influential horror manga. 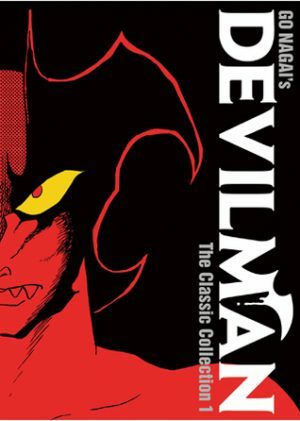 If you like horror manga or classics I would highly suggest checking out Devilman: The Classic Collection Vol 1 by Go Nagai.